Sunday November 3rd 1901 It was a stormy day with snow and very cold. Will and I were here alone all day and fixed a few things that were very necessary to be done. Mollie got back jist before night from Tiffen. Monday November 4th 1901 Very cold. I put done the carpet in the sitting room after dinner that I had sewed in the morning and when Mollie came from school we had a fire in it. Tuesday November 5th 1901 I sewed and put doen the carpet in the dining room and got things in order in the sitting room. weather a little warmer than yesterday. Wednesday November 6th 1901 I was busy with baking in the forenoon and after dinner it seemed so pleasant we did some washing. Mother & Hattie were out in the afternoon. 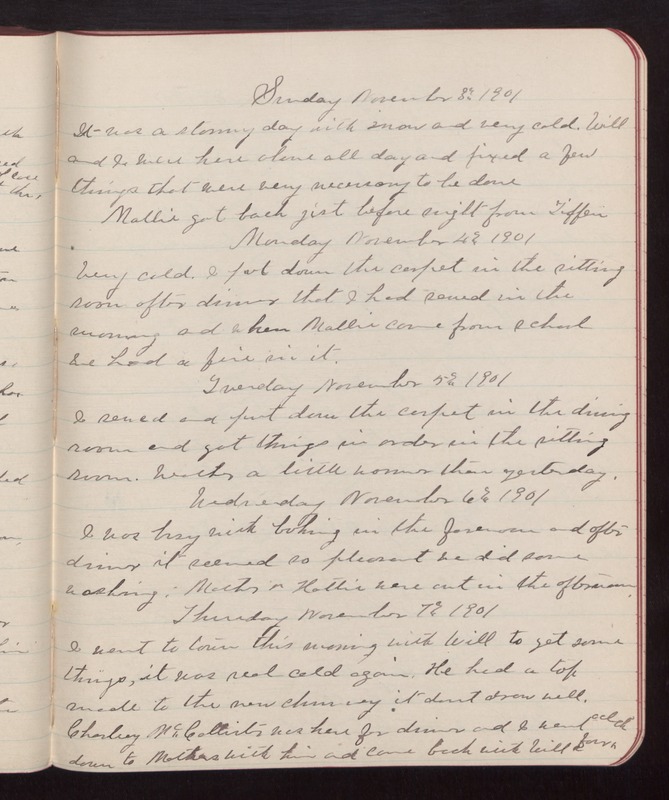 Thursday November 7th 1901 I went to town this evening with Will to get some things, it was real cold agian. he had a top made to the new chimney. It dont draw well. Charley McCallister was here for dinner and I went down to Mothers with him and came back with Will at four oclock.